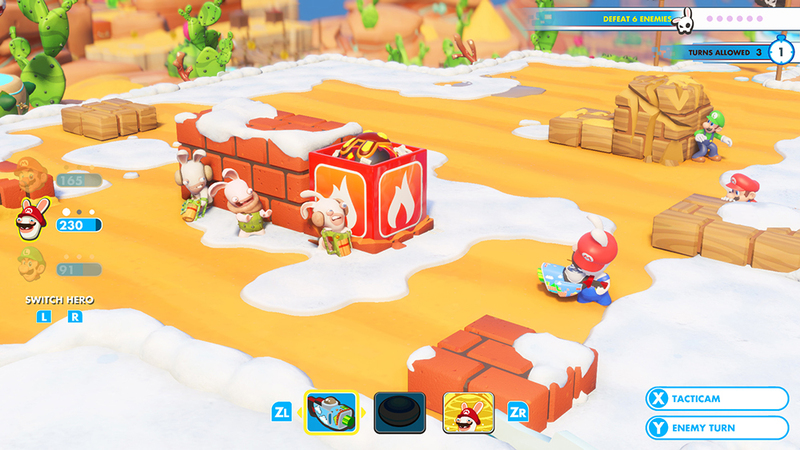 Mario + Rabbids Kingdom Battle is an excellent game that against all odds manages to be something more than a mere cheap knockoff under the guise of a franchise crossover. Try as the haters think they might, Ubisoft’s infamous Rabbids don’t ruin the overall experience, and regardless of whether or not you’re a fan of their previous games or just their plain existence, there’s no denying that this game is the next best thing to having XCOM on the Nintendo Switch. It’s a turn-based tactical game that takes place in the Mushroom Kingdom, featuring characters from the Mario franchise as well as Ubisoft’s Rabbids, who have accidentally acquired a dangerous piece of technology that combines beings into a single entity, and have somehow made their way to Mario’s wacky world and made a mess of it. In order to make things right, it’s up to the mustachioed hero and some new friends, namely Rabbids who’ve taken characteristics from Princess Peach, Luigi, Yoshi, and even himself, as well as other more familiar faces to dash and shoot their way through many crazy battles with not-so friendly Rabbids and other baddies. Granted, there are some things that make Mario + Rabbids much more than a simple clone of Firaxis’ venerable series. Unit movement feels much faster and less locked down due to how easy it is to get from one side of the map to the other thanks to your three-character squad’s ability to use each other as springboards to propel themselves further ahead. That happens when you move one hero over another’s spot on the grid. There are also pipes that connect different spots on the battlefield and are absolutely a blast to use. Same thing goes for enemy forces, which should be more than enough keep you on your toes all throughout the game’s numerous combat scenarios. Those elements, married to the simplified shot accuracy percentages that range from 0, 50 or 100%, depending on what cover your units — or the enemies — might happen to be sticking behind makes the encounters that much more dynamic, fast-paced and less frustrating than anything we’ve seen in XCOM. Cover is in constant shift during battle, because most of it can be destroyed, an aspect of the game that can both play to your advantage and disadvantage, depending on the situation. Depending on its type — be it high or low — cover can take only a certain number of shots before giving way, leaving whoever’s behind completely open to attacks. Characters with spread shot weapons are particularly nasty in this regard, and are invaluable in certain situations, given their knack of getting rid of obstacles in a single shot. Shots are also important in the way they can eventually activate elemental effects depending on the weapons that you equip your characters with. They comically range from pushing characters out of bounds to inking their view and not allowing them to shot back at you, or even lock them into place by sticking their feet to the ground with honey. Obviously, the same goes for your enemies, who are keen on focusing on a single member of your team if you’re not careful. Even in its relatively simple gameplay and short duration for missions, there are still some moments of annoyance in the game, especially after the halfway point, where trickier enemy types who can teleport around the battlefield are introduced. Mario + Rabbids ramps up the difficulty quite noticeably at that point, making fights longer and more involved, outnumbering and often outflanking your team from the get go. Some mission ranking objectives also become noticeably stricter, limiting the maximum number of turns you can take to sometimes a ridiculously low number. In the grand scheme of things in Mario + Rabbids, though, ranking isn’t particularly important considering that you get a whole lot of coins anyway by simply exploring the world and when you finish fights, but they do help you get closer to the ever-needed weapon and skill tree upgrades by giving you bonus coins and skill points. It’s also worth noting that every single mission can later be replayed, so if you don’t hit gold during your initial run, you’re welcome to jump back in once you beat that world’s boss and try again. Speaking of which, skill trees are a thing in Mario + Rabbids. Each of your characters has their own unlock table in which you’re able to plop down points and unlock active and passive combat abilities. There are a handful of things you can invest that are universally available for all characters, such as movement range and health point upgrades, but the character-specific skills make each of member of your roster feel unique and suited for specific scenarios. For instance, Luigi is a sniper with plenty of range and damage potential, while Rabbid Mario just happens to be really good at attracting and keeping enemies distracted while the rest of the team circle in for the kill, who paired with Rabbid Peach’s buffing skills can be an invulnerable powerhouse for a few turns. It goes without saying that Mario + Rabbids is positively brimming with personally. If you’ve taken a gander at any of the footage that’s out, you’ve probably noticed how beautiful its art direction is, each of its worlds totally different in visuals and atmosphere to the other. The characters are also something else. I can’t claim I was ever a fan of Rabbids before playing this game, but I have to admit they grew on me while I was playing. Rabbid Mario in particular is surprisingly charming and charismatic, always hopping about with his banjo in tow and mimicking Mario’s gibberish, but it’s also worth talking about the other Rabbids that you start your team with, who are somewhat cute in their own eye-popping, screamingly grotesque way. But the big take away from the game is definitely its soundtrack. Handled by industry veteran Grant Kirkhope, who handled the tunes for a large portion of Rare’s Nintendo 64 and Xbox 360’s catalogue, most notably Banjo Kazooie Nuts & Bolts and Viva Piñata, simply killed it when it came to scoring Kingdom Battle. Fans of his previous works will recognize his musical style right away, a perfect fit to all the silly shenanigans taking place on screen, be it lazily running about solving box puzzles in between fights under the tune of a cheerful background tune, to the awesome compositions that play during the boss fights that dot the i’s of each of the game’s story sections. It’s baffling to me that it has taken this long for Kirkhope to get to mess with the classic Nintendo tunes, but man, I’m glad that it’s finally happened. Mario + Rabbids Kingdom Battle is brilliantly simplified in ways that don’t necessarily dumb it down for the naturally younger audience that it’s aimed at. There’s enough satisfying depth that older players can appreciate the game for what it’s worth. Sure, it’s certainly no substitute to the core XCOM experience. You won’t be spending hours save-scumming your way through a tough nut of a mission, nor will you have to deal with the ins and outs of base management during an alien invasion. Mario + Rabbids is quick, easygoing, straight to the point, hilarious and most importantly, it’s a whole lot of fun. And it’s all the better for it as a pop in, pop out game for the Nintendo Switch.